Researchers from Harvard School of Public Health pooled the results of three prospective cohort studies that followed the medical history and lifestyle habits of health professionals. These studies were the Health Professionals' Follow-up Study (HFPS), which included 51,529 US male dentists, pharmacists, vets, osteopathic physicians and podiatrists, aged from 40 to 75 years; Nurses' Health Study (NHS), which began in 1976, and followed 121,700 female US nurses aged from 30 to 55 years; and Nurses' Health Study II (NHS II), which followed 116,671 female US nurses aged from 25 to 42 years beginning in the year 1989. Within the three cohorts 15,156 cases of type 2 diabetes were identified during the follow-up period. The researchers found that the total dairy consumption had no association with the risk of developing type 2 diabetes. They then looked at consumption of individual dairy products, such as skimmed milk, cheese, whole milk and yogurt. When adjusting for chronic disease risk factors such as age and BMI as well as dietary factors, it was found that high consumption of yogurt was associated with a lower risk of developing type 2 diabetes. The authors then conducted a meta-analysis, incorporating their results and other published studies, up to March 2013, that investigated the association between dairy products and type 2 diabetes. This found that consumption of one 28g serving of yogurt per day was associated with an 18 per cent lower risk of type 2 diabetes. Previous research has suggested calcium, magnesium, or specific fatty acids present in dairy products may lower the risk of type 2 diabetes. 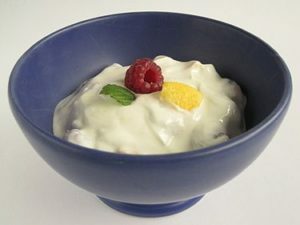 It has been shown that probiotic bacteria found in yogurt improves fat profiles and antioxidant status in people with type 2 diabetes and the researchers suggest this could have a risk-lowering effect in developing the condition. Next article:Walnuts Have Anti-Cancer Properties?